New wet snow falling this afternoon on high winds may contribute to wet snow avalanche problems as older wind slabs turn wet today. Wet loose avalanches, or sluffs, are also possible today, even on the older snow surface. Sluffing will be more intense in areas of Monday’s drier snow, which appears white when compared to the darker, melt/freeze surface. Beware of the sliding fall potential that exists today particularly on shady areas this morning. Any avalanche activity today should be easily avoidable and limited to the more recent snow becoming wet in the sun or being further loaded this afternoon by up to an inch of new snow drifting on increasing winds. LOW avalanche danger exists today in all forecast areas. Around lunchtime on Thursday, April 11, 2019, two hikers took a break on the summit of Lion Head. This ridge separates Tuckerman Ravine from a stream drainage to the north known as Raymond Cataract. 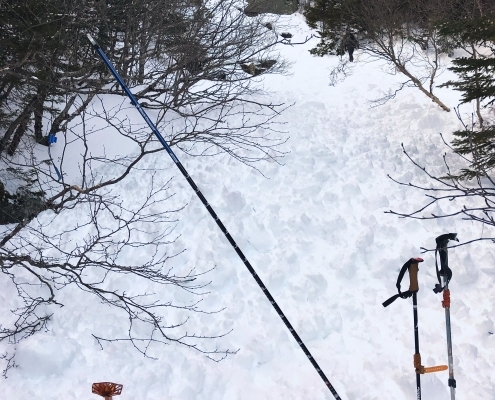 While on Lion Head, they noted a skier descending into Raymond Cataract, an ephemeral, but recently popular ski descent only possible during winters with a deep snowpack. 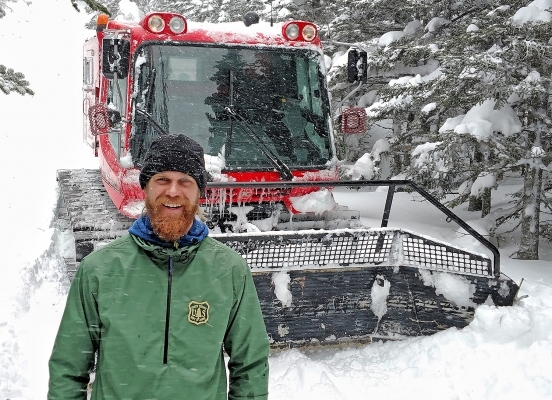 Help us improve the backcountry avalanche forecast! 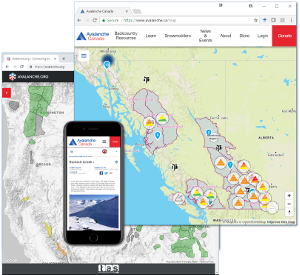 We are working with partners in Canada to better understand how we communicate the avalanche risk, and we need your help. Please fill out this survey. It will take a few minutes, but it will help us as we work on new ways to give you the most important avalanche information. Questions? Concerns? Looking for information? If you see us in the field, or at the USFS Hermit Lake Cabin, please say hello. We love talking about the snowpack, the avalanche forecast, weather, skiing, climbing and likely anything else you have on your mind. Looking for photos and videos? Social media allows us to post current information quickly and seamlessly when available field time and good visibility allow. Check us out and be sure to follow us to stay informed. We’ll post upcoming events and field observations along with the most current photos from the field whenever we can.